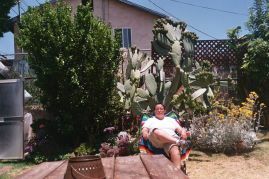 I am a Chicana marimacha from East LA. I grew up in the Maravilla area beneath the two jails and near the I-710 Freeway (originally the 7 Freeway). I am the daughter of Natividad Avalos Reyes and Julia Socorro Hernández Reyes. In 1987, my mama passsed away. I was 18 years old. Her death forever changed my life. It paved my road in life as a poet and educator. I am proud to have attended Hammel Street School (’81), Belvedere Jr. High School (’84) and Garfield High School (’87). Throughout my schooling, I detested English classes; I did not know how to write. Ironically, I was enrolled in College Prep classes, yet my essays were layered in red ink due to grammar errors. I did not have the required grades for “regular” university admittance. Thank you Educational Opportunity Program for opening the doors for me. I am grateful. At San Diego State University, I enrolled in remedial English courses, kindly labeled Academic Skills. I failed the pass-fail exit exam twice. But I passed it the third time. Since then, I have flourished in my writing. I have a BA from Long Beach State University (1995) and a MFA from University of Texas, El Paso (2000) in Creative Writing. Several geographies have affected my writing. East LA is my corazón. El Paso, Texas schooled me in border culture. Toronto, Ontario I witnessed the beautiful creation of a Latina/o community. I am grateful for my experiences up in la blue frontera. As an educator, I believe in empowering students. Over the years, I've worked at El Paso Community College (Rio Grande and Valle Verde campuses), Humber College, Long Beach City College's Upward Bound program, and currently, California State University, Los Angeles.------Poetry saved me. I write for my communities: Mexican, malfloras, la jotería, immigrants, writers, academics, y familia. I write to bridge and fill in the gaps in the literary world. I write so that queer youth, straight kids, neighbors, Mexicanas/os can see a reflection of themselves in literature. I write to give voice to my jota experience. I am a poet for el barrio. I am the East LA Poet. Winner for Best Poetry Book in English from the 2014 International Latino Book Award. Winner for Best Poetry from Golden Crown Literary Society Awards, Goldie Award 2014. Finalist for Lambda Literary Awards 2014. Second Place for Best Book Cover Design from the 2014 International Latino Book Award. Lucas Artist Fellowship for Montalvo Arts Center (May 2013); Fellowship for Ragdale Foundation (April-May 2011); Scholarship for Macondo Writers' Workshop. Macondo Foundation. (July 2010); NEA Fellow for Virginia Center for the Creative Arts(April-May 2009); Scholarship for Napa Valley Writers’ Conference 2008; Artist Grant for Vermont Studio Center(April 2008); Emerging Artist Poetry Award for Astraea Lesbian Action Foundation (2001); AWP Intro-Journal Project 1999, “El Diablo” (2000).